Seal lungs can take a terrible pounding when one of the mammals leaves the surface. When the lungs collapse during deep descents in order to protect the animal, the delicate tissues incur damage as they are crushed, then suffer blood and oxygen flooding back when the animals return to the surface. In addition, the fragile tissues could suffer inflammation, which is usually triggered to heal any damage. Yet a team of researchers from various institutions across the United States, including Allyson Hindle of Harvard Medical School and Milton Levin of the University of Connecticut, found no evidence of damage to pulmonary tissues in these deep-diving species. Their study is published in the July 9 edition of Journal of Experimental Biology. Wondering how elephant seals and Weddell seals protect their lungs from the potentially damaging inflammatory response that should be triggered by the injuries to which the lungs are exposed when they make a deep dive, the team tested whether blood samples from the two species offered any protection from the effects of inflammation triggered by a bacterial toxin, lipopolysaccharide. Impressively, the toxin triggered barely any inflammatory response in the seal blood, in contrast to human blood samples, which experience inflammation 50 to 500 times greater. And when the team added serum extracted from seal blood to mouse immune cells, the serum quenched the inflammatory response. 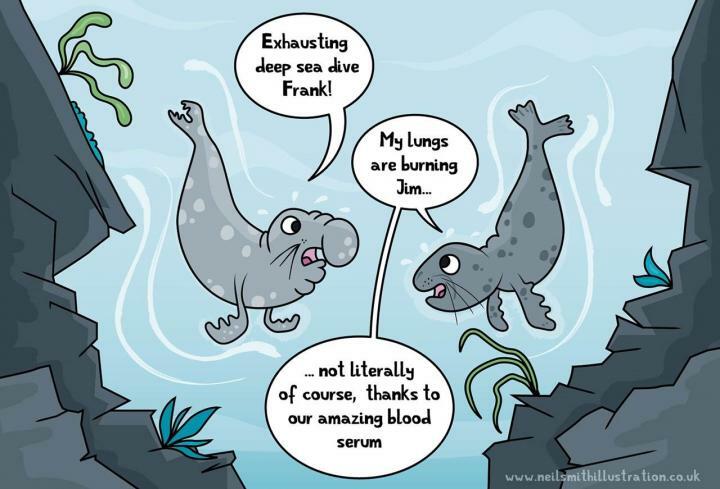 "These data suggest that seal serum possesses anti-inflammatory properties, which may protect deep divers from naturally occurring inflammatory challenges, such as dive-induced hypoxia-deoxygenation and lung collapse," say the researchers. They would like to identify the protective compounds, in the hope of being able to use them to extend the survival of organs used in life-saving transplant surgery. The study was funded by a grant from the Office of Polar Programs, NSF #1443554. Bagchi, A., Batten, A.J., Levin, M., Allen, K.N., Fitzgerald, M.L., Hückstädt, L.A., Costa, D.P., Buys, E.S., Hindle, A.G. (2018). Intrinsic anti-inflammatory properties in the serum of two species of deep-diving seal. Journal of Experimental Biology 221, doi:10.1242/jeb.178491.